For the perfect little dining room decor piece, you may want to consider one of the many table centerpiece ideas that you will find below. From a wide array of colors to the most unique designs, you will find all of the best ways to give your dining room table the attention that is so deserves. The table centerpiece ideas are all something that many people overlook to help create the perfect spectacle as one of the many dining room accents that you bring in will help you get even more out. From the center of attraction to something that may have otherwise been missing, virtually every dining room decor can be significantly enhanced by what is considered below. From the best dining table centerpiece ideas to the most unique, formal, and extravagant, taking into consideration the occasion as well as the rest of the dining room decor will help make this the perfect accent. Many of the can be created with the most common or basic items that you have in your house or home garden as the idea that screams luxury or unique doesn’t always have to come at the expense of spending a ton of money. Mixing some light and color have always been the most traditional table centerpiece ideas as this simple addition of using a mix of candles along with the right touch of glass not only creates the visual appeal, but can also create one of the romantic settings. For this simple idea, food coloring, water, a small glass vase, and a plain white candle will be needed. Using different size vases and floating candles in water, drop different colors of food coloring into each vase to create the following allure. This will surely create the special spectacle, and is a great addition to any formal or informal dinner. Whoever said that there is no place for animals on the dining room table as the following table centerpiece ideas shows you otherwise. A common fish bowl that can be purchased from any local pet store along with unique or even a couple of the most basic gold fish ca create this special dining table centerpiece. Try adding some greenery or a red rose coming out of the bowl itself to increase the appeal and to the overall attraction. Traditional floating candles in standard glasses or a vase among flowers placed in the glass itself makes this one of the most beautiful table centerpiece ideas. This can be created using any colorful flowers that you have in the home garden as the brighter colored flowers such as pink, yellow, and red work the best. The color from the flower petals will also turn the color of the water a shade of the same color which will help to complete this dining table centerpiece. Fresh flowers have always been one of the most popular and most revered table centerpiece ideas as the fresher the better. Tulips, roses, dandelions, and any of your favorite floral arrangements can be used as the idea of the perfect centerpiece will further compliment the dining table decor is anything that you feel is perfect to liven up the dining room decor. A good mix of fresh flowers and small snacks is another cheap, easy and unique table centerpiece ideas that you can consider. Matching the colored flowers with the tablecloth or other room accents helps to create the perfect design complement the rest of the dining room. Other consideration to take into account while trying to match the rest of the room accents are the napkins on the table as well as adding some candles into the mix. If you are planning on entertaining large amount of people, adding some fresh fruit not only provides a good, healthy snack to any meal, but also adds some color to the dining room decor. Both are wonderful additions that are usually great hits for many visitors and is a wonderful addition for many family engagements or holiday events such as Christmas gatherings. Floral arrangements of any kind is one of the table centerpiece ideas that is probably the most common. Instead of purchasing fresh flowers each and every week, try buying artificial flowers that can be alternated and used with different patterns or for different dining room experiences. Making changes will be cheap as well as easy as the price of artificial flowers for use as a dining room centerpiece is quite cheap considering all of the locations where they can be found. 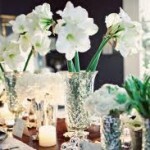 Using different table centerpiece ideas for various holidays such as Easter gatherings, Christmas festivities, Thanksgiving feasts, or romantic Valentine dinners is a unique, and helps to make any dining experience memorable. The memories that will be created can last a lifetime, as the many dining table centerpiece ideas that you will find here may just help you out. Brighter Easter colors such as yellow, purple, pink, and other colorful floral petals helps to create a hand-crafted arrangement that works well for any Easter gathering. Whether the entire family is coming over or you are just looking for something to display for the week prior to Easter Sunday, this floral arrangement, candles, and unique accessories can be found from many items from your local arts and crafts store. Table centerpiece ideas can be used for any special occasion, informal, or formal gathering as this one very easy to use idea can become the hit of any dinner occasion. If looking for the perfect room accent for any standard duration or the once in a lifetime centerpiece, using a bit of creativity and some unique appeal may just be all that has been missing from your dining room decor.